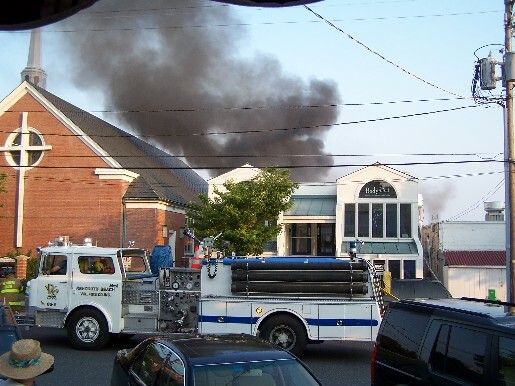 What seemed almost a routine trash fire caused smoke and even fire damage to some of Rehoboth Beach's best known restaurants. 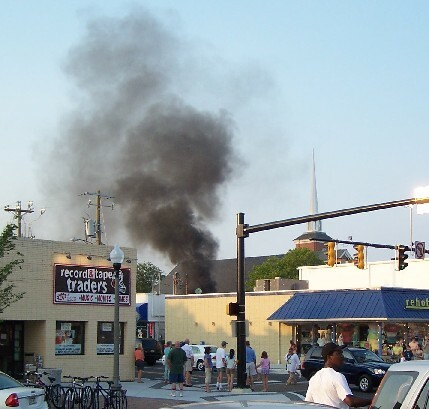 At 7:21 p.m., firefighters were dispatched to 10 North First Street, the rear of Jammin' Joes -- between Adriatico Ristorante & Café and Nicola Pizza -- for a reported trash can fire. 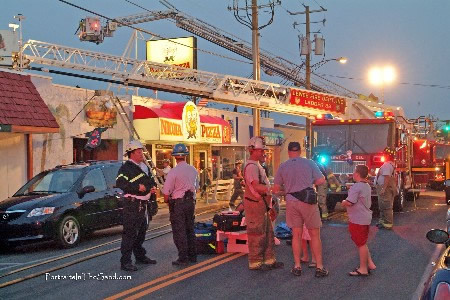 Firefighters arriving on the scene feared the fire was threatening propane tanks and an immediate evacuation was ordered of all businesses in the area, including the Back Porch Café on Rehoboth Avenue. Many people abandoned their meals when police and firefighters came rushing. One of the heroes of the evening was Stan Mills. 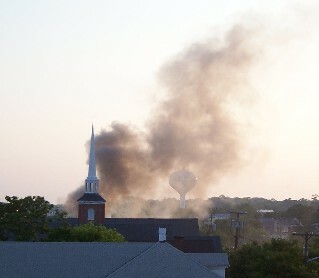 When he saw the smoke coming from the area of the church while out walking, Stan says he called police, and warned people to evacuate the area because of the propane tanks. He remained in the area for hours helping police and firefighters with crowd control. It may go down as the most photographed event of the season. People lined the streets with their cell phone cameras, digital cameras and video recorders as firefighters fought the fire. Despite smoke often blowing in their faces, people lined the streets, almost in disbelief, as firefighters fought the stubborn blaze. Photographer David Koster from Portraits In The Sand said he saw the smoke and headed downtown where he shot the photo above (right), among others, of firefighters working on the roofs of the restaurants. On the left is a picture from the top floor of the Admiral Hotel on Baltimore Avenue. Many of the businesses suffered smoke damage; firefighters reported fire extending into the roof areas. In their radio conversations, they also suggested that the fire may have been gas-fed. Jeff Blizzard of the Rehoboth Beach Volunteer Fire Company told WUSA-TV late Sunday evening that this appeared to be an accidental trash fire, but was under investigation. Damage amounts were not yet determined. Officials requested that fire investigators, liquor control, building inspector and health department representatives be notified of the restaurants involved. In addition to Rehoboth Beach VFC, several Sussex County fire companies, along with county paramedics, state police and DelDOT, assisted with the fire. 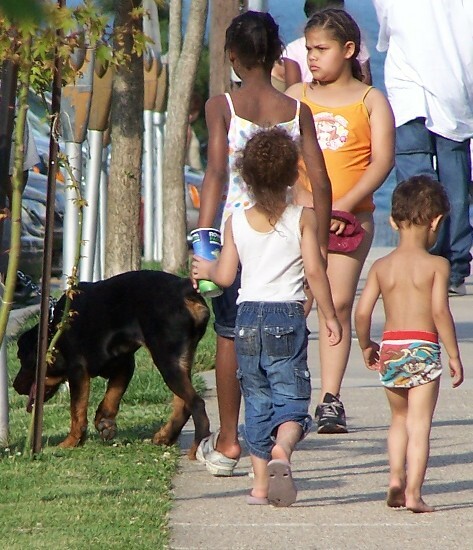 Rehoboth Beach police received a call Saturday for a rottweiler locked in a van (above) was possibly in distress. An officer arrived around 5 p.m. and radioed his dispatcher that a dog was indeed in the van, a window or windows were slightly open, but the officer said the dog did appear to be panting somewhat but not in significant distress. Two witnesses who had seen the dog in the green Ford Aerostar van said the dog appeared to be possibly dehydrated and expressed concern about the dog's welfare. The dispatcher told the officer to remain with the van while the SPCA was notified. Around 5:30 p.m., a SPCA officer gave an estimate of 30 to 45 minutes to arrive to investigate the complaint. When the occupants (below) of the van returned, the dispatcher told the police to prevent them from leaving until the SPCA arrived. 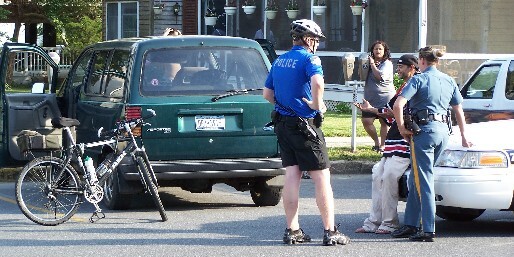 As of 6 p.m., the SPCA still hadn't arrived, and the officers remained with the van's occupants. Police did not mention what charges over the radio, if any, the occupants faced. 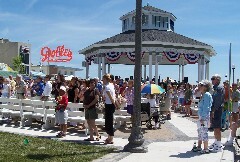 The Rehoboth Avenue streetscape ribbon-cutting ceremony was held Friday at the bandstand which remains under construction. Politicians, including the governor (above), various officials and long-time locals were among those who attended the event in the hot sun. 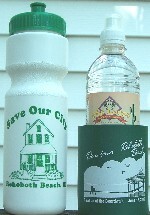 The people from Save Our City distributed information and bottled water in commemorate blue or green foam beverage holders. Shown from left to right (above) are SOC volunteers: Mable Granke, Howard Menaker, Nancy Martin, Tom Wester, Mary Cookie Brusnighan. SOC also gave away "Bike to Town" maps and 400 plastic bottles to encourage bicyclists to attend the event and take note of the city's new bicycle racks. Nancy Martin said the SOC plastic bottles feature an image of the typical Rehoboth Beach cottage. 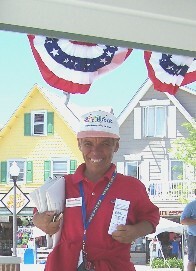 Nancy Martin, by the way, edits regular informative SOC e-mail newsletters which cover topics affecting Rehoboth Beach. To join her list, send her an e-mail to: nancymartin2@verizon.net. Great aerial shot (left) of the new bandstand from David Koster (Portraits In The Sand). Those in attendance face the flag as the Cape Henlopen School Jazz Band performed the National Anthem (above left). 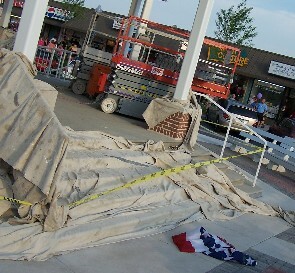 Work resumed on the bandstand after Friday's ribbon cutting. 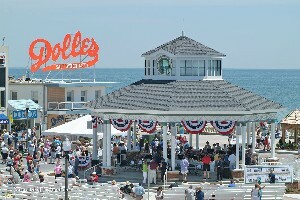 Shown is the bandstand on Saturday (above right). 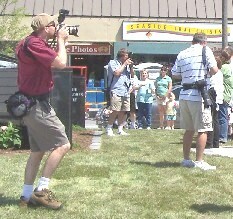 The ribbon cutting was a big event for local professional photographers. A few shown above (left to right) include David Koster (Portraits In The Sand), Marc Clery (Delaware Coast Press), Dan Cook (Cape Gazette), Chuck Snyder (Rehoboth Beach VFC safety officer/photographer), Scott Nathan (The News Journal). Speaking of photographers, Kevin Spence will exhibit his documentary-style photographs, Home Town News: Narrative Photos, a Contrast of Lifestyles, at the Design Center of Rehoboth at 112 Atlantic Avenue. Kevin was originally a New York City reporter and photojournalist, now working for the Cape Gazette. His opening is Saturday June 24, from 5 to 8 p.m., but the exhibition will continue through July 24. 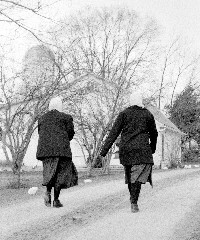 Kevin's photo of two Amish women was taken in Middlefield, Ohio. Cheryl Blackman smiles in the shade of the new Rehoboth Beach Bandstand Friday afternoon after a brisk day of KINfolk raffle ticket sales. She says her goal this year is to beat the $21,520 she raised last year. As of June 15 she reported $5490 with the sale of 1098 tickets. But that does not include her work during Friday's ribbon cutting. Cheryl has been in eight movies and four commercials. When she isn't collecting for charity in local restaurants, look for her working at the north boards Grotto Pizza. At least three pedestrians were struck in Ocean City this weekend -- two by hit & run drivers. Two of those struck appeared to be in serious condition. A woman described as being in her mid-20's was hit around 12:25 a.m. Saturday on Baltimore Avenue at Worcester St. Among those rendering aide was former Ocean City Mayor Jim Mathias. The woman was initially reported unconscious but still breathing after getting hit by the driver's side of a black Chevy Blazer. The driver remained on the scene in this accident. 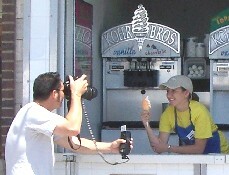 Chris of the Breaking News Network sends the above picture from his camera phone. A 40-ish-year-old man was also seriously injured when he was hit by a silver 1990's Ford Ranger which fled the accident. That happened around 2:05 a.m. Sunday morning at 5 Philadelphia Avenue. The Ranger is reportedly missing its headlamp and turn signal light. Police were still searching for the vehicle later Sunday. It has a possible tag of 23M127, a "gator net" on the rear, and was last seen headed out of Ocean City on U.S. Route 50 after the accident. A paramedic's radio report said the man was struck on his left side, rolled over the Ranger's hood, then fell to the ground. He was briefly unconscious, but later complained of orthopedic injuries and right quadrant pain. He was taken by helicopter to Salisbury. The third pedestrian and the second hit & run took place around 6:10 p.m. Sunday on 85th Street. Injuries in this incident were not as serious as the other two. But the woman driving the white four-door 2006 Toyota Corolla fled the scene. After broadcasting a lookout to both state and county police, an officer stopped her, or a woman believed to be the suspect, at U.S. Route 113 and Route 90.